Have you ever found a restaurant just on the edge of town, where the service was warm, the drinks were cheap and the food was out of this world? Everyone knows when you find a spot like this the first and most important thing you do is KEEP QUIET. Because once the masses discover it, its uniqueness and perfection will be overrun with "reservations only" and articles in the paper about the "best kept secret" that is now a secret no more. Well, I am here to tell you that such an equivalent exists in the world of knitting, a place so perfect, warm and remote that its followers return year after year and are committed to keeping it quiet... until now. 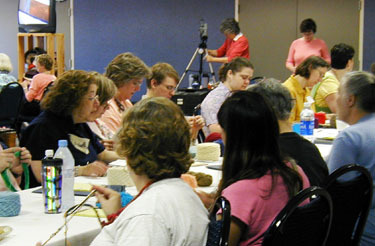 I have been a knitter for years; have taken classes and workshops with some of the best-known names. I have traveled to major metropolitan areas to attend knitting conferences in large convention centers. I have stood in line to get a brand-new knitting book signed by the author. I have swarmed with the masses over the latest yarns and techniques. This summer I chose a knitting event at a less-traveled venue. I packed my bags and traveled 2000 miles by plane, and an additional 200 by rental car, to arrive at in a small town -- a town without a Starbucks, or any hint of knitting paparazzi -- to the town of Marshfield, Wisconsin. Unless you are a knitter, you have probably never heard of Marshfiel,d Wisconsin, or its neighboring town of Pittsville. But knitters in-the-know recognize that Pittsville, Wisconsin, is home of Schoolhouse Press and its knitting guru, Meg Swansen, daughter of the late Elizabeth Zimmermann (often referred to as "EZ"). Traveling to such a spot is a knitting pilgrimage of sorts. If Julia Child is the queen of French cooking, and Elvis is the king of rock and roll, Meg and Elizabeth are the goddesses of knitting. 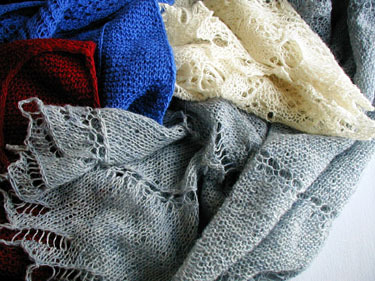 Elizabeth Zimmermann is a name in the knitting world that makes nearly everyone smile and nod. She first inspired knitters in the late 1950s to break free from patterns and "think for themselves". Through a collection of books and television programs, Elizabeth's fame and business grew. In 1974, Elizabeth established the first knitting camp in central Wisconsin -- a tradition that is now carried on by her daughter, Meg Swansen. There is a new generation of knitters who have discovered EZ's teachings are timeless fundamentals of knitting. 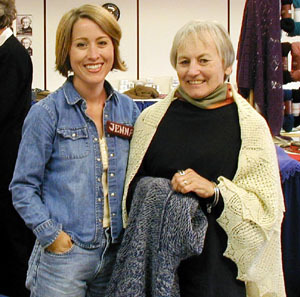 The first sweater I ever designed was because Elizabeth's "Knitting without Tears" book inspired me to believe I could. I was already a knitter when Elizabeth passed away, and regretted that I had never attended one of her camps. Driven to not make the same mistake again (us knitters are especially sensitive about not repeating mistakes), I knew I had to go. Anything worth having is worth fighting for, and knitting camp is no exception. The first challenge of going to camp is being accepted. There is no simple on-line registration and they don't accept credit cards over the phone. So you must fill out your paper application, enclose your check, and have your application date stamped no later than midnight on April 15th. If you are late or early, you are likely out of luck. [I thought perhaps this was a joke, or a test of my knitting commitment, to make the payment due on tax day.] And as I traveled to the post office with my IRS check in one hand and my knitting camp application in the other, I had a brief second thought. But both checks cleared the bank, my application was accepted, and I was headed to Wisconsin. Which brings us to the present day, when I boarded a plane in Seattle, landed in Minneapolis, picked up my rental car and drove nearly 4 hours into the tiny town of Marshfield. On my way there, I passed a breathtaking rural countryside as well as road crossing signs for Amish horse and buggies, and snowmobiles. I arrived at the unassuming low-rise hotel where knitting camp is held, stepped out of my car, and sunk into the gravel parking lot surface with my high-heeled shoe. When I checked in and inquired about the availability of in-room mini-bars and "HBO On-Demand", I merely got a raised eyebrow. And then I topped off my announcement as a tourist when I politely asked directions to the elevator and was told "Uh, you are in Wisconsin, now, honey; the stairs are over there". I had arrived. I slept fitfully and awoke early the next morning to join the other 50 knitters in the tiny conference-room-inspired meeting place. The room was bright and warm, filled with a multitude of intricately knit sweaters, many knit by Elizabeth herself. You won't find a novelty yarn or cotton blend anywhere here, but instead find yourself surrounded by traditional classics knit with wool and a never-ending eye for detail. The set-up of the room is brilliant; a table in front where Meg sits, and other adjoining tables and chairs arranged in a horseshoe shape around her. Most importantly, you will find a video camera positioned just over Meg's shoulder, with numerous TV monitors set up around the room so everyone can watch, close-up, what she is doing. The camp is organized over 4 days. 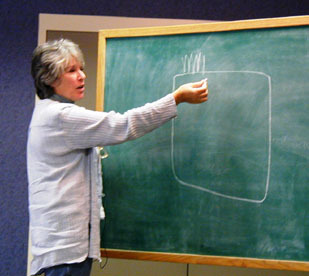 The first half of each day, Meg teaches with an informal style guided by questions and interests of her students. The latter half of the day is show and tell. In the evenings, students break off into informal large and small groups for dinner. I should pause here to tell you that dinner in Marshfield is an experience itself, and you would be a bad tourist if you did not partake in the well-known deep-fried pickles, cheese curds or Friday-night fish fry. After dinner, students reconvene and return to work on their projects and have their questions answered by the instructors...and everyone knits well into the night. Meg tells all students at the start of class "this class is for you. Spend your time however you like." She provides instructions for several possible projects -- a Russian prime baby sweater, a Bavarian twisted stitch knit cap, or a lace shawl -- and throughout class, she gives instructions on each. Additionally she will fly like lightening through all other techniques and questions, teaching crocheted steeks, lace knitting, Fair Isle tricks, hems, cutting knitting, intarsia, a multitude of cast ons, and a few insider tips that made the room gasp with glee and delight. I learned more in these four days of knitting camp than I have in all other classes I have ever taken. As Meg said, "this knitting stuff is really unending". In-between instruction, fellow knitting teachers Joyce Williams [below] and Amy Detjen (outstanding knitting visionaries in their own right) mill around the room encouraging, laughing and helping everyone with their projects. Amy Detjen is witty, outspoken and infectiously charismatic. She wears only purple, has a love of chocolate-covered ice-cream bars and drives a motorcycle. She will affectionately tease you. She called me "the most yuppie knitter she ever met", made fun of my well-appointed knitting bag, and then sat with me for nearly an hour as I grafted together rib stitch, calling me a "good little knitter" and telling me I know exactly what I'm doing. I felt included and special, like when your bullying big brother hugs you and you know he loves you best of all. 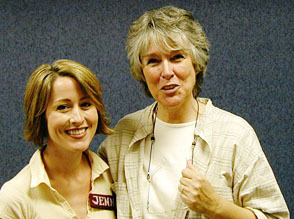 The yin to this yang is fellow instructor, Joyce Williams, who is gentle and soft-spoken. It's easy to miss Joyce, distracted by Meg's rock-star status and Amy's boisterous spirit, but I will admit a special affection and appreciation for her. I unknowingly inspected one of her Fair Isle sweaters and found it done to absolute perfection. When she told me the sweater was hers, I bought her book "Latvian Dreams" on the spot without even opening it- for I knew I was in the presence of genius. Since reading her book cover-to-cover, I will tell you it is an underestimated treasure and includes such things as instructions for top-down-gloves on two circular needles and hundreds of color pattern charts. 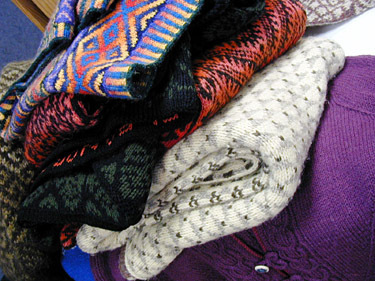 An endless number sweaters line the edges of the room, and you are welcome to hold them, even try them on. There is something magical about touching the very sweater you saw Elizabeth knit in one of her many videos. How intimate to inspect her stitches. You can even practice your kitchener stitch join on the tiny gauge swatches that Elizabeth created 30 years ago. Meg will put them in your hand with a darning needle and you will feel like part of her family. There are many moments you will feel you are gathered around Meg's kitchen table; the way she talks, and listens with such ease and grace. Conversations and debates often spring up about the best cast-on for each type of project, and Meg will answer, listen and learn along with you. During one such moment, a fellow student demonstrated a unique cast-on technique shown to her by her late-mother, Gwendolyn. It was unfamiliar to all the students and instructors, so Meg invited her to the front to teach the class, and for the rest of the week, we affectionately referred to it by its new term as "Gwendolyn's cast on". A spirit of community and sharing is interlaced in everything at camp. Meg will tell you stories of her family -- her mother, her late husband, her children, and her grandchildren. Family is all part of the business of Schoolhouse Press. Meg's son Cully showed up one afternoon and her daughter-in-law Michelle took and filled orders for yarn and books. Knitters with an astute eye will even recognize one of the models in Meg's book to be an employee of the hotel where camp is held. When you attend camp, you become an extension of this family spirit. There are a million little details I am still not telling you about knitting camp -- how Meg freely gives away patterns, needles and packs of yarn to students, how there is a massage therapist in the back of the room to soothe sore knitting hands and shoulders, how students bring gifts of fresh raspberries and newly cut flowers or knitting markers for everyone in the room. I am not telling you how the instructors show up each morning at 8:00, and don't leave until nearly 10:00 in the evening when all questions are answered. How Meg, Joyce and Amy will pour into your head each and every knitting trick they have, and how Meg will clap with delight at your project when you show it to her, no matter how big or small. I will even confess that Joyce Williams whispered a knitting secret into my ear, a technique that she swore even the gurus didn't know, and when she told it to me, I felt nearly famous. If there is one thing that you will find in that tiny building in Marshfield, Wisconsin, it is that Meg's generosity bleeds into each and every person there. 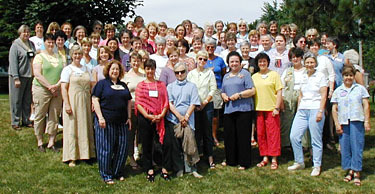 I will attend knitting camp next year, and both hope and regret that I might see many of you there as well. A secret so precious is worth holding close, but as I have learned from Meg Swansen, also worth sharing. 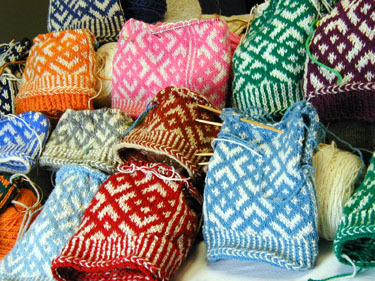 For more information about Knitting Camp, visit the Schoolhouse Press website. Jenna Adorno lives in Seattle, works in the software industry and dreams of being paid fabulously to knit garments full time. She can be found here.